***** on 01/09/16 Our Ideal Sukhomlyncki Divas ***** on 05/09/16 Teacher Day ***** on 10/09/16 September Test ***** on 28/09/16 Birthday of Shaheed Bhagat Singh. S. Gurdev Singh Kang Memorial Rural Institute For Career Courses, Bassi Gujjjran has been functioning since 1997. It is situated in Bassi Gujjran near Chamkaur Sahib, about 25 Km away from the Ropar Railway Station and is spread over an acres of lush green land in calm, pleasant and pollution free environment. The surroundings are picturesque and ideal for an educational institution. The newly constructed building is open, airy and functional. 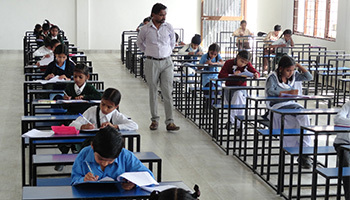 The school has classes from Pre- Nursery to class XII. RICC is a co-educational day-boarding school. It is affiliated to Punjab School Education Board, Mohali(Punjab). Top most educated faculty is available to teach in classes from nursery to +2 Science stream. In +1 and +2 the boys and girls can opt either non-medical subjects. Arts subjects are not allowed, but the project is under consideration. The institute feels proud to give free education to 50-60 poor students every year. Medical facilities are also provided to the needy also. Moreover it takes pleasure to help them in higher education. Sukhomlinski, a famous Soviet educationist is the ideal of S. Swarn Singh Bhangu the Director of the institution. Director Sir took inspiration from sukhomlinski and Shingara Ajarhi to serve the society living in rural areas by giving their wards standard education and proper guidance. At RICC curriculum plays a very important role as we at RICC believes that learning is not just about teaching, books but much more than that. Sports and physical activities play a very important role in the overall development of the child and all of us at RICC give a lot of importance to it. School designed curriculum with Extracurricular activities which provide more opportunities for students to develop skills, character, and leadership.